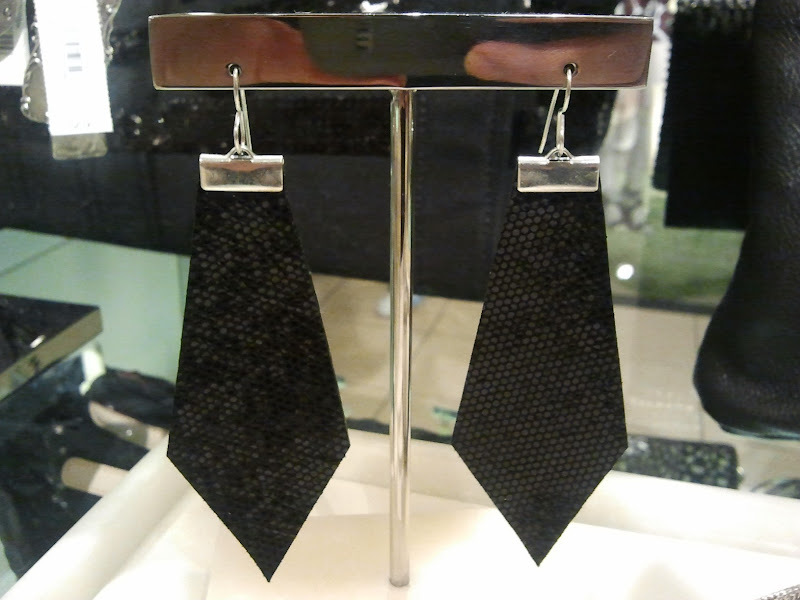 I was walking around in Nordstrom last month and ran across some seriously chic leather earrings. After some inspection I decided that I was not going to spend $60 on them and that I could probably make them myself. So off to the craft store I went. Below are the earrings I was inspired by (yes, that is a creepy camera phone photo). You can buy them at Nordstrom right here: Daly Bird 'Katie' Diamond Cut Leather Earrings. I had leather (unfortunately not black) in my pile of fabric from a little shopping spree I had a few weeks ago. I simply sketched out the shape I wanted the earrings to be and traced onto the backside of my leather. I used some scissors to cut the leather out, but to be more precise and are not in a rush to create earrings before you go out (oops), you should probably use a razor and a ruler to cut a straight, clean line. Take your ribbon crimps and crimp them onto the top of the leather. Attach your earring hook with your pliers-- flaunt!